You know what's fun? Seeing celebrities on Dancing with the Stars channel John Travolta, Janet Jackson, Madonna, and Channing Tatum. 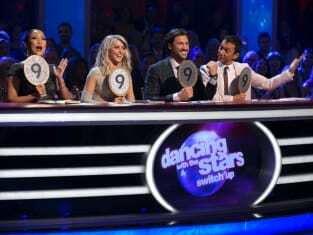 On Dancing With the Stars Season 21 Episode 7 the couples danced routines inspired by famous dances, including iconic dances from Grease, Dirty Dancing, and even Magic Mike. Yes, they definitely went there. As a whole, this had to be the best episode of Dancing with the Stars we've seen this season. The show plays to the audience well by pulling in those iconic routines, making us feel that much more a part of what's happening. We become even more invested in the dances as they speak to nostalgia. Oh, and did I mention that Leah Remini was back as a guest co-host? Because she was, and she's amazing. It really is too bad that Hayes didn't know what Grease was before this dance, though. He did a good job, but that one as the first dance, and with Olivia Newton-John as a guest judge? No pressure or anything. As usual, Bindi and Derek rocked the dance floor, this time in Dirty Dancing style. Seriously, why do we no longer get encore performances? This is one we need to see again, please. Of course, that's not the only one we need to see again. Carlos has done well in this competition, but he's not someone I've paid much attention to so far. Well, nothing says pay attention like a Rumba inspired by Channing Tatum in Magic Mike. The whole thing may have made him uncomfortable, but he showed his confidence on the dance floor. Tamar and Val's jazz routine to Rhythm Nation was also incredibly fun to watch. Their perfect scores were definitely well-deserved. So how about those results? I don't think anyone was surprised to see that this week, it was Paula and Louis who were sent home. She took it with grace, exclaiming how excited she was to be able to go home and see her grandchildren. Now, though, the competition is going to get even more intense. It might just be anybody's game at this point. What did you think of this episode of Dancing with the Stars, and who do you expect to win this season? Share your thoughts in the comments below!